Courtney and Silas were married on October 7th, 2017 in Youngstown, Ohio. Courtney started off her day by getting her hair and make-up done with her girls at Aria Salon Studios in Canfield, Ohio. Then, the bride and the bridesmaids went back to Courtney's parents house where they finished getting ready. From there, the bride and the bridesmaids travelled via limo to St. Christine's Parish in Youngstown, Ohio for the ceremony. Before the ceremony, the groom and bride both had their portraits taken. After the ceremony, the bride and groom took their family formal portraits in St. Christine's Parish. After the family formals, we travelled to Mill Creek Park in Youngstown, Ohio to take bridal party photos and bride and groom portraits. The photos took place at Pioneer Pavilion, my secret waterfall and at the Suspension Bridge in Mill Creek Park in Youngstown, Ohio. After taking lots of gorgeous photos, we travelled to the reception venue, which was Drake's Landing in Canfield, Ohio where the bride and groom, and their family and friends danced, ate, and drank the night away. 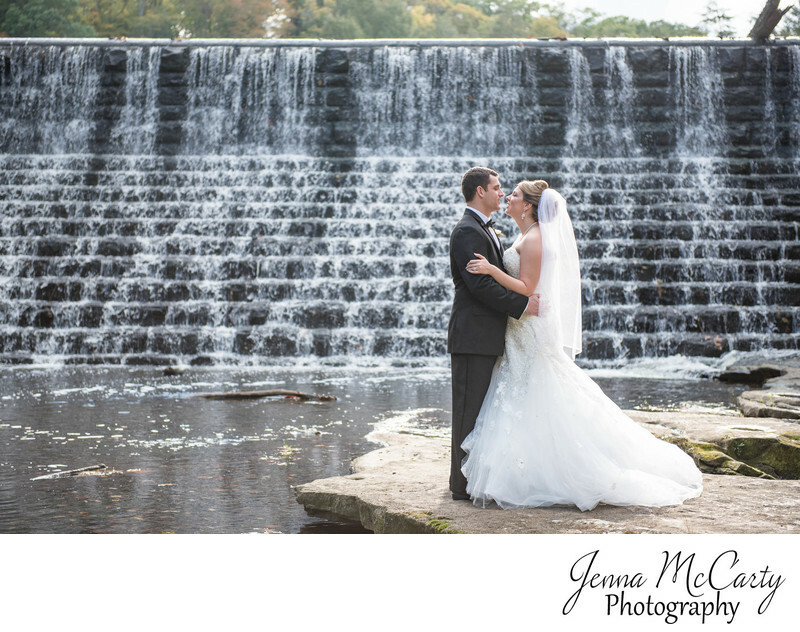 This photo features the bride and groom in front of what I call my secret waterfall. I love using this waterfall and I won't tell anyone how to get it to, except my clients who are going there.